I have been terrible at keeping in touch here, for which my apologies. Sometimes the novel just takes over - which for a writer is what's meant to happen. You should see my neglected in-trays, both physical and email. Shocking. Go on now. Go. Go. So he went. And I did too. Want to see where he went? Here! Finally that thing has happened that always needs to happen for me to write a book - to really write it, to get into the flesh of it and bring it to life. I have fallen in love with my subject. Not just the characters - I am always in love with my characters, even awful ones. No, I now officially love my subject. Some book subjects have been easy to love - Vermeer paintings, medieval tapestries, quilts. Others are harder: fossils, cemeteries. I am writing a novel about trees. Trees are easy to love - some of them. I am particularly partial to beeches. I also love apples and by extension their trees, and the first half of the novel is about them and Johnny Appleseed in Ohio. The other half is about Californian redwoods and sequoias. In writing about them I've ended up writing about William Lobb, an English plant collector who first introduced redwoods and sequoias to Britain in large numbers in the 19th century. Lobb was also very big on pines. Pines. The very word makes me sigh. I've never been a big fan. 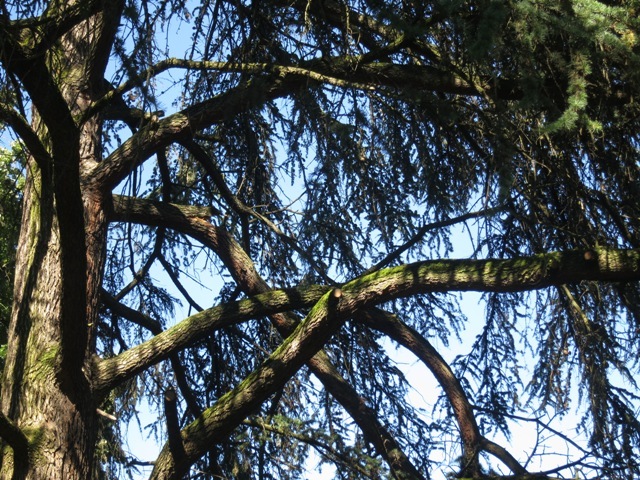 I have always found conifers - trees with needles rather than leaves, that remain green all year round - boring. Until now. I happen to be in Geneva for the week, writing. And two weird things have happened. First: there are tons of giant sequoias, shooting above all the other trees in Geneva's parks. This is unusual, as they are certainly not native to the country. I went out looking at them and the other weird thing happened: I fell in love with conifers. The lack of leaves allows you to see more of the sky behind them so there are great silhouettes, and the trunks and branches are more exposed so you can see the trees' architecture. They have become beautiful to me, as a person does when you love them. Being in love makes it so much easier to write. Thank you, Geneva! I expect that will get people's attention! It’s funny where writing has led me. I’ve given tours in cemeteries and gone fossil hunting in the name of research. The Last Runaway drew me into the seemingly tame world of quilts. Not so tame, it turns out. Quilting has led me into a prison cell. I am curating a quilt/art show for Danson House, a Georgian Mansion outside of London. It opens next month, when I will write more about it. One of the pieces for the exhibition is a quilt I commissioned from the UK charity Fine Cell Work, who teach prisoners how to sew, embroider, and do needlepoint. The prisoners make cushions, quilts and other handiwork, which are for sale on the FCW website. Have a look, it is a wonderful charity, and the merchandise is gorgeous. The prisoners – mostly men, surprisingly – make a little money to save for their families or for when they get out. But even more importantly, the work gives them a sense of purpose and pride. I have visited prisons four times now, and each time I leave with a feeling of wonder at how stitching can have such a therapeutic effect.